Mid-length hair is the suit-all length that can make you turn heads without having to spend hours in front of the mirror. 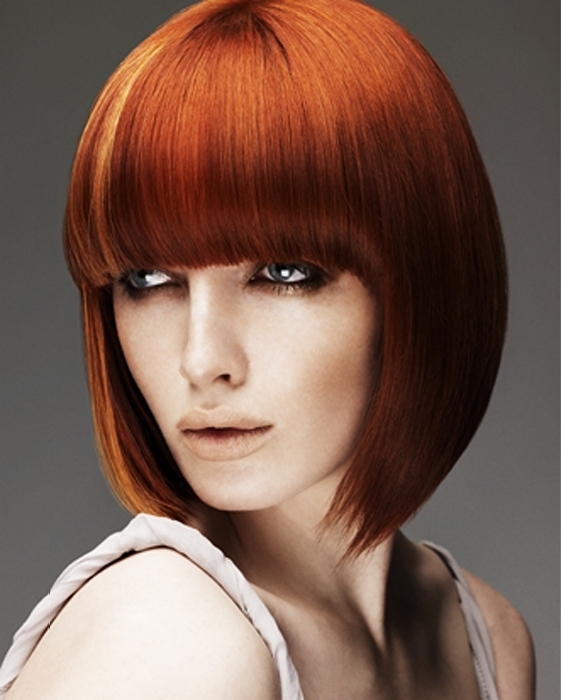 Get ready to make a change by opting for the latest mid-length haircuts with bangs. Mid-length haircuts are the new buzzword as far as haircut trends go, as they suit everyone and they're easy to style, creating a perfect balance between versatility and maintenance. Medium length haircuts look stunning especially if paired with a stylish set of bangs, that not only make the best of one's facial features, but also add a little bit of a twist to an ordinary look. Mid-length haircuts with bangs look amazing and can definitely bring a different air to your look, regardless of your natural hair texture. Because bangs pose as one of the quickest and easiest ways to a hairstyle change, hair stylists have improved their cutting techniques and developed various bangs styles to compliment all facial features. There is definitely a bangs style out there to suit your needs and personality, so draw inspiration from the hottest mid-length haircuts with bangs and turn to a professional for a complete makeover. This season, mid-length haircuts are all about natural, easy texture that promote low maintenance and require a minimum amount of products and tools. Layers are truly a perfect option if you're in love with hair volume, as they help remove some of the hair's weight, enabling the hair to receive more texture. Medium layered haircuts, whether soft or choppy, can be paired with stylish side swept bangs, long or short as well as blunt or asymmetric cut bangs, the result enabling you to obtain a unique look. Add a bit of texture through your midi with the help of volumizing products and sweep your bangs to the side for a grungy look or channel your inner diva on the outside by going straight or curly. A blunt cut hairstyle that features graphic lines can be a perfect match for women who want to underline their facial features and blunt bobs are the most popular way to go. They are super diverse and can vary in length, in addition to working super well with various bang styles. Go for a blunt cut classic, chin length, but if you're more of a vintage glamour type of chick, go edgy by cutting you hair asymmetrically, shorter on one side and longer on the other, keeping your bangs swept to the side. Blunt cut hairstyles rely on healthy glossy hair to look fabulous, so keep the hair in great condition and style it as you wish. From smooth sleek straight to pumped-up volume, these hairstyles will definitely make you look hot.